Clarets boss Sean Dyche admitted Burnley were far from their best against Leeds - but the result is all-important, especially at this stage of the season. 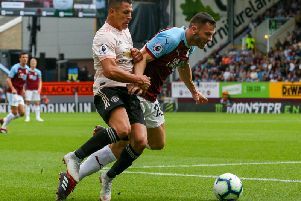 Burnley maintained their lead at the top of the Championship, as Scott Arfield's eighth goal of the season, after 58 seconds, proved enough to see off the visitors at Turf Moor. It was an 18th league game without defeat, and Dyche said: "We were nowhere near as good as we can play with the ball, but the resilience and effectiveness of the side without the ball gets us the win. "Apart from the great goal, and if Boydy's goes in shortly afterwards, I think the game's done, but credit to Leeds. "No one plays a game to lay down and accept it, especially not when the cameras are here, and sometimes, the weirdness of 1-0 almost makes teams play more freely, and they did, whereas they know we're tight and the crowd are a bit tight with the emotion of it, and to see our way through the game and get the win is important. "You can't always be at your magical best, but you can do the basics and the hard work, and there was certainly a lot of that." The Clarets again "found a way" as Dyche puts it, to grind out the win, and he added: "It's important over a season, because people forget, with the run we've been on, people have seen us play some unbelievable football, the Brentford game, beating teams 4-0, 5-0, the last few we've had to grind for different reasons, at Brighton I thought we were strong, very good second half but had to grind the feel of the game, against Cardiff we kept going and going, played some good stuff and didn't get the win, and today was a different one, but you have to find a way. "If you want to be successful in any industry, certainly in football and the Championship, you have to find a way to win, and we've done that. "It doesn't matter how they come at this stage, early season you're building, moulding and forming, and that's an important stage because it has to have a future. "Now, it is about getting results, and we've taken care of our own business today and that's the challenge, we don't talk about anyone else, we talk about ourselves and what we're looking to achieve." Striker Sam Vokes, the Championship player of the month, came off with a groin problem, and David Jones was replaced after feeling unwell, and Dyche explained: "We don't think they're too serious, Vokesey got off quick, which we're pleased with, so we're hopeful on that one, and Jonah was feeling unwell. "When Tom threw the ball out, I went over and told Steve, 'he's unwell' and no one wants to see what can happen when someone is unwell on a football pitch!